What is fire? How are wildfires ignited? How do California's weather and topography influence fire? How did the California Indians use fire? In the spirit of his highly acclaimed Introduction to Air in California and Introduction to Water in California, David Carle now turns to another fundamental element of the natural world, giving a fascinating and concise view of this complex topic. His clearly written, dramatically illustrated book will help Californians, including the millions who live near naturally flammable wildlands, better understand their own place in the state's landscape. 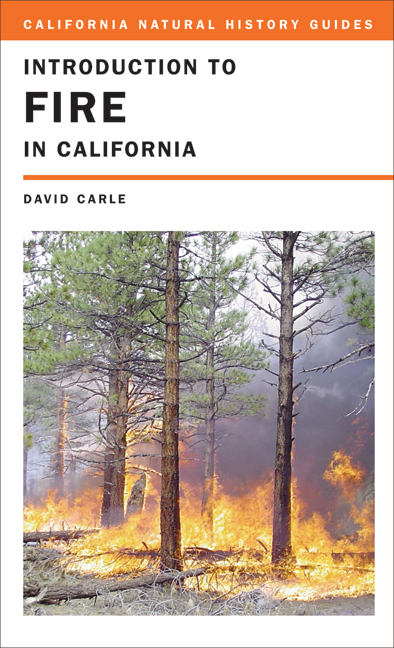 Carle covers the basics of fire ecology; looks at the effects of fire on wildlife, soil, water, and air; discusses firefighting organizations and land management agencies; explains current policies; and explores many other topics.